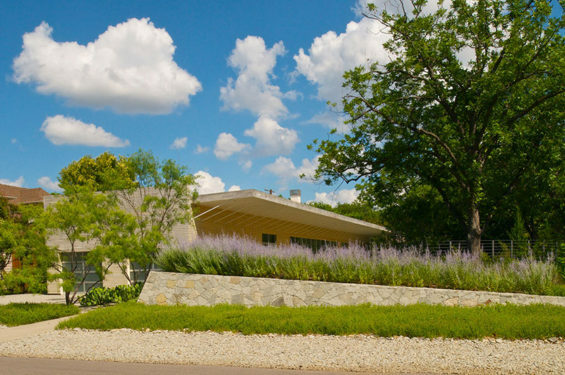 This residential landscape emerged as an holistic approach to the design of both house and garden through an intensive collaboration of the architect, the landscape architect, and the client. 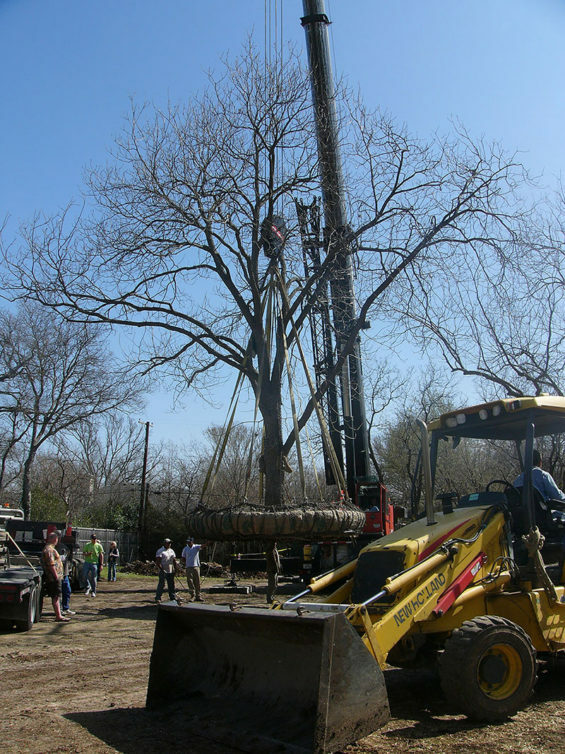 The interdisciplinary dialogue very early decided, for example, to save and transplant an existing specimen 20” caliper pecan tree that was sited within the footprint of the future house. Transplanting the tree to the garden portion of the site provided a critical shading device within the new landscape. The integration of garden and house continues in the site design. The site is a rectilinear urban city lot which has been designed innovatively as two halves. 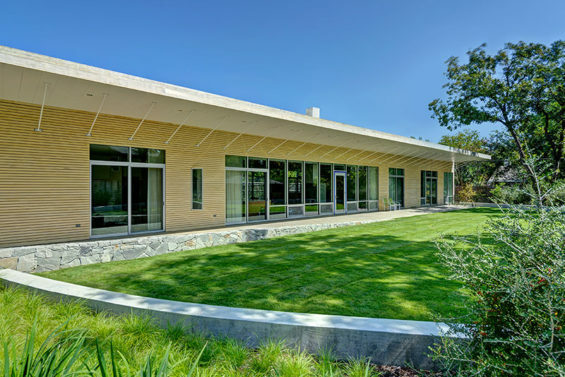 All the windows and doors face the garden as a dramatic 129’ long wall of almost continuous glass. Care was taken that the new home with it’s atypical porch-side entrance fit contextually with the adjacent traditional street-facing neighbors. 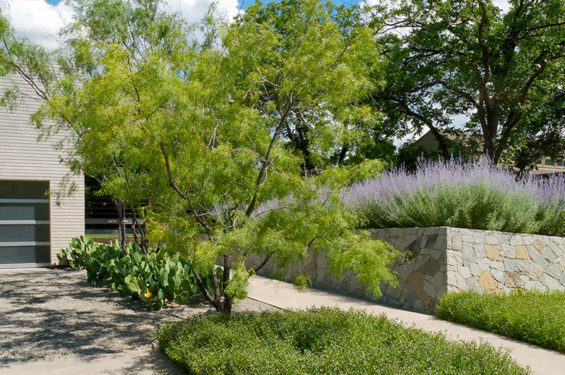 Thereby, a defined front entry sequence becomes a major landscape design element. 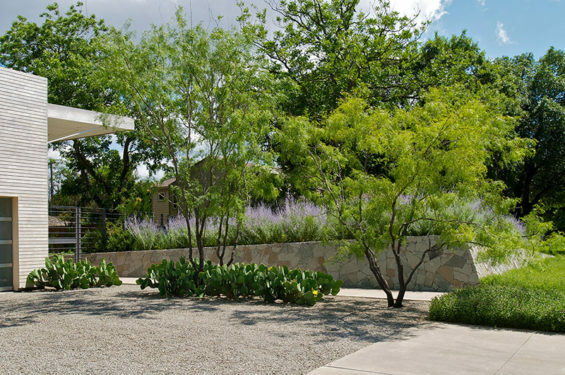 The entry is an understated concrete walk lined with an allee of multi-trunk mesquite trees. Along this axis is a 3’ wide masonry boulder wall, which follows the line of the walk and further defines the entry procession from the street. 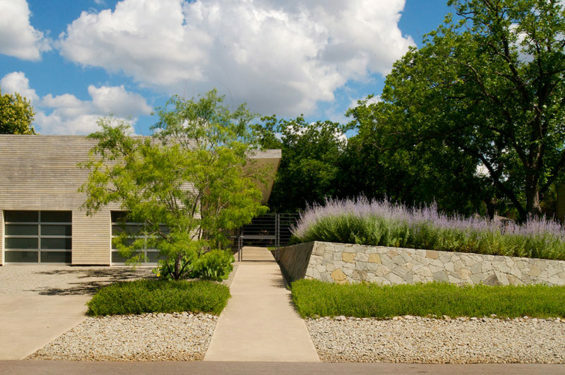 The wall spectacularly manages to be both casual and formal as it erupts from the ground, creating an impressive uplifted angle along the linear entry walk to the front door. This provides a visual compression that intuitively becomes a guide towards the entry gate and the porch beyond. Once through the entry gate, clear and simple geometry continues to define spaces in the garden. 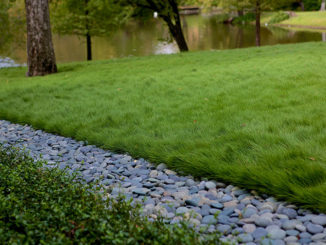 A formal lawn provides a multi-use active zone. A very simple curved steel fence and gate maintains transparency but allows for security. 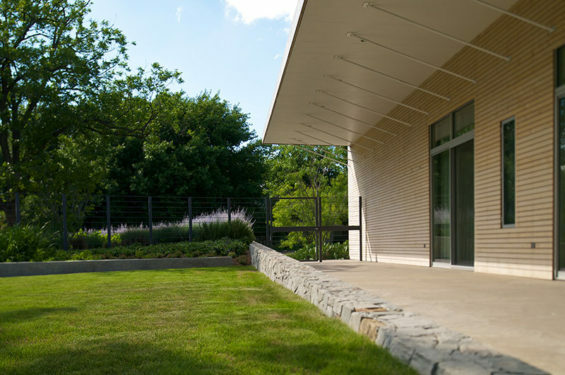 As it traces through areas of the garden, the fence reinforces the merging of architecture and landscape that characterizes this project. 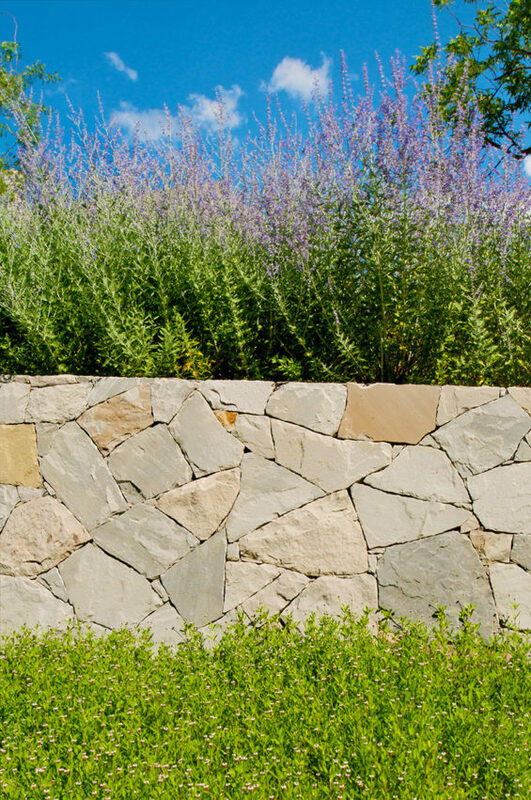 Details include a low cast-in-place concrete seat wall defining the formal lawn. On the opposite side of the house, a simple space becomes an extension of the interior. A stone paver terrace becomes a carpet for flexible furniture layout. 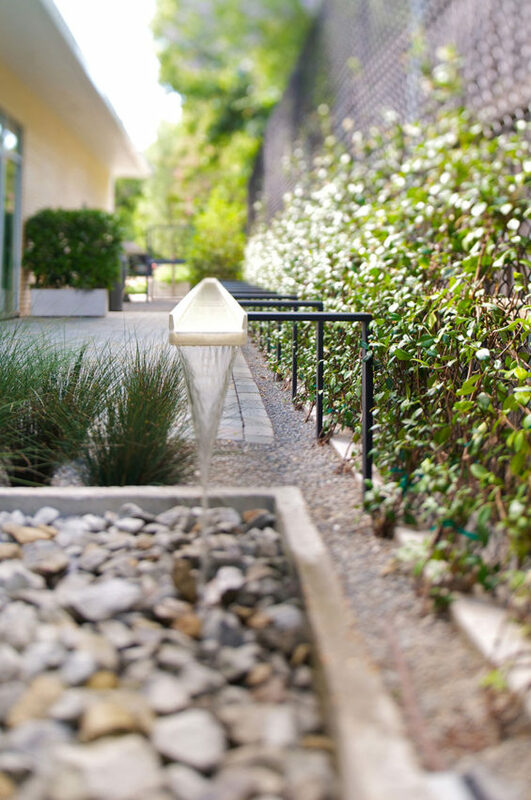 A water feature consists of a simple white steel channel which becomes an elegant runnel transporting a water current from one end of the garden to the other, then spilling into a concrete trough surrounded by plantings. The white runnel visually floats in front of a planted green screen of simple black vinyl chain link. Agricultural concrete troughs become planters for the client’s kitchen garden. Native and adapted plantings area arranged to compliment views from the house and provide screening. Rainwater is collected from the houses’s canted roof into three 2500 gallon cisterns for irrigation. 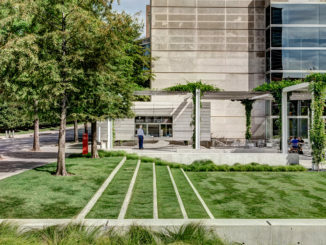 A permeable groundplain composes 90% of the landscape– through bands of rip rap, stone pavers, planted areas, and crushed aggregate. 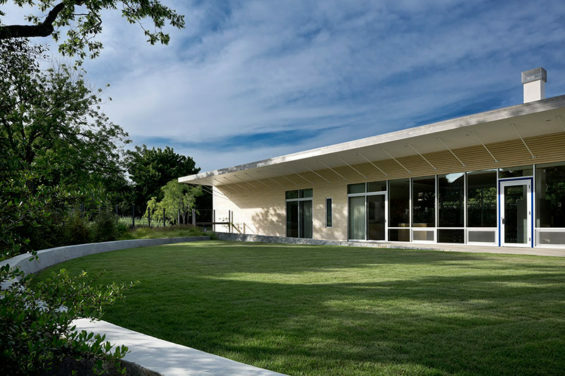 This house and garden function as one flexible, active, and resilient space with dissolved boundaries and transitions between exterior and interior.